Lehigh Valley Health Network (LVHN) offers a variety of educational work experiences for both high school and college students to help introduce the next generation of health care providers and health care business experts to careers in this industry. At LVHN, we offer three types of student learning experiences: LVHN Summer Work Experience, Nonclinical Internships and Research Scholar program. LVHN believes that it’s never too early to gain a mentor. A grant from The Dorothy Rider Pool Health Care Trust makes it possible for 16 rising seniors from Building 21 High School in Allentown School District to have part-time positions within different LVHN departments. Marilyn Reyes works in Environment and Sustainability under her mentor, Katherine Velekei. Through the Summer Work Experience, Reyes was introduced to a new field: agriculture. Her work in Environment and Sustainability led to opportunities to discover her passion for agriculture. Reyes now hopes to pursue a career in agriculture business. The Internship Program was launched this year with a total of 15 college students working in the nonclinical side of LVHN. Yesenia Cano, a rising senior at Penn State University, is an intern in the Cultural Competency department at Lehigh Valley Hospital (LVH)–17th Street campus. Working with mentor Judy Sabino, Cano learned about the skills needed for medical care translation. “Even as someone who is fluent in Spanish, I didn’t realize the competencies and skills needed to interpret until witnessing interpretation firsthand,” says Cano, a Health Policy Administration major. One of her projects, updating the language access plan, requires Cano to analyze the changes in census data from 2000 to now to reflect demographic trends in our region. The Research Scholar Program hosts 40 students from 24 different colleges and universities. Students who are selected for this program must complete a research project while here at LVHN. One of the scholars, John Hanna, a rising senior at Muhlenberg College, works with Savitri Skandan, MD, hematologist oncologist with LVPG Hematology Oncology. Hanna’s project is called, “A Retrospective Review of Outcomes for Patients with Limited Brain Metastases Treated with Gamma Knife® Radiotherapy.” Hanna is reviewing cases of patients treated at Lehigh Valley Cancer Institute for limited brain metastases to see which types of treatment were more effective. After graduating in spring 2019 with a biochemistry major and math minor, Hanna is confident that his experience at LVHN will prepare him for medical school in the fall of 2019. Are you a student interested in health care? Whether you are sure you want to go into health care or want to explore possible careers, a summer learning experience at LVHN might work for you. To apply for the LVHN Summer Work Experience, you must be a high school student at Building 21 in Allentown, PA. Jenae Holtzhafer is the program coordinator and main contact for the Summer Work Experience. For the nonclinical internships or the research scholar program, you must be a college student. The contact for the nonclinical internship is Karla Bachl, director of volunteer services, and Kerri Green is the contact for the research scholar program. The nonclinical internship is aimed towards college students who have a relative already in the LVHN community. The application for the research scholar program can be found online under the Research & Education tab on LVHN.org. These summer programs range from six to eight weeks during the summer months across LVHN’s campuses. 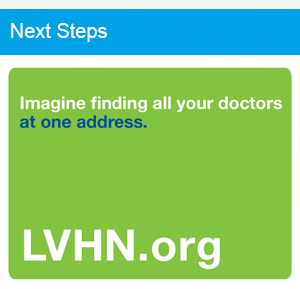 To learn more about the opportunities that LVHN’s provides, visit LVHN.org/research_and_education. Visit LVHN.org/volunteer to learn more about other ways to stay involved with LVHN.